What is folder attachment of an eMail? As you know, you can attach the files to an email, these files can be called as file attachments. Follow this sense, "folder attachments" means that the attached folders of an email. Why need folder attachments in our automailer - AMSSE? As you think, for a manual email sending, folder attachment does not make any sense, because you can manually compress the folder as a .zip file, and then use file attachment to replace the folder attachment for sending. But, since our automated email software is used to send email automatically, folder attachment is very useful. Consider this requirement (or similar): one of your programs generates some log files in a folder (fixed path), and the program may clear the old logs periodicity, and you want to share the new logs to the related colleagues per hour, so you chose our automated email software to do it automatically, and replaced the manual operations (in fact, you cannot do it manually, because you need sleeping, then you will lose some updates). In this case, folder attachment is very useful for our automated email software. Just attach the fixed folder to an AMSSE email template, and schedule this template, it will work as you wish. 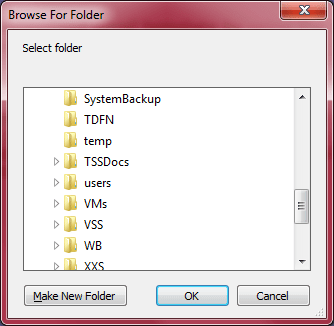 How to enjoy folder attachments feature in our automailer? As below screenshot, very easy: just click the folder icon at the top of “Attachment” area, choose the target folder, and click <OK> button. And then save your template with other settings, schedule it as you need. Screenshot A: attaching folder feature of our auto mailer. Screenshot B: Selecting folder attachment function of our auto mailer. Download Our Auto Mailer for Windows® Now!